Richard Dawkins and the other prophets of atheism love to tell us that in the fabricated battle between religious belief and rationalism, there can be only one winner, and that their side is finally gaining the upper hand; the days of superstitious belief in sky pixies and the like are numbered – at least in the enlightened West. The tide is turning, and it is their hope that, in time, all religious belief, including Christianity, will be seen as little more than a dwindling remnant of the age of ignorance. This is the dawning of the Age of the Nones, where science and technology are the new gods to be worshipped and revered. In that last and possibly most significant statistic, what we’re really seeing is the obvious mass shift in identity from residual cultural Christianity to ill-informed agnosticism. For decades, people have been turning their backs on our churches and, as the generations have passed, knowledge of the Christian faith has dimmed as parents have failed to hand the light on to their children. Yet, despite all the apparent gloom for the religious (and joy for the proactively anti-religious), there is another side to the coin. Life is unpredictable. Who, for example, is kicking themselves wishing they had put a couple of quid on Jeremy Corbyn back at the start of the Labour leadership contest, when he was a 200-1 longshot? Christianity has faced far greater threats in the past than its current wobble in Europe. The entire history of the olive branch which was grafted onto to the Judaic root has been one of continuous and miraculous survival. Put in the context of unending wars, persecution and systematic ‘cleansing’, the Faith has come through time and again. Only a brave or foolish commentator would predict the current decline as being terminal. If you want to find signs of hope for the Christian faith, you need look no further than the new Perceptions of Jesus, Christians & Evangelism report, carried out for the Church of England, Evangelical Alliance and Hope. Based on extensive polling by ComRes, this focuses on practising Christians in England and there are plenty of juicy morsels which may come as a surprise. For example, nine per cent of the 3,000 respondents described themselves as practising Christians. Proportionately, as a percentage of their age groups, there are as many 18-34s as the over 65s, and approximately twice that of the 35-64 age bracket. This would suggest, contrary to popular belief, that the number of practising Christians, rather than declining, appears to have bottomed out and is now beginning to bounce back. Almost one in five of employed practising Christians are working in education, and one in ten works in healthcare or education, which says something in itself of the effect that faith has in determining how Christians seek to live their lives. Four out of five working Christians have degrees, which is almost double the national average. Atheists might think their stance is by far the most credible and intellectually superior, but there are vast numbers of very well-educated people who have come to the opposite conclusion through both reasoning and experience. Christianity is anything but the preserve of naïve fools. This last point might give the impression that our churches are full of white middle-class people, and yes, they are. But again, proportionately, you are much more likely to find a black adult who will profess the divinity of Jesus than you will of any other minority ethnic group. 43 per cent of all English adults believe in the resurrection of Jesus Christ from the dead, and one in five non-Christians, when talking about faith with a Christian, want to know more – even to the point of seeking an encounter with Jesus. This figure is higher among the 18-34s, and goes to show that there are millions of young adults in particular who want to know more about Jesus, despite their lack of knowledge. They just need to find someone to talk to who can enlighten them. And there is a huge number of people who do need enlightening. 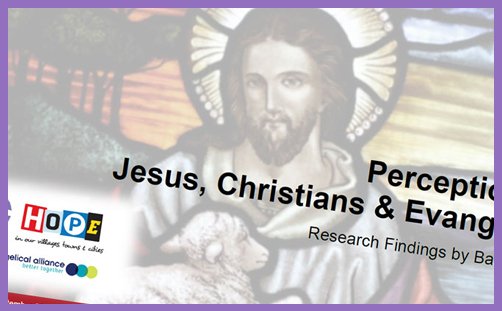 Probably the most astonishing finding in the entire survey was that 22 per cent of respondents thought that Jesus was fictional, and almost as many again weren’t sure if he ever actually existed. That’s potentially 40 per cent of the population who know so little about the Christian faith that they are not remotely aware of the overwhelming historical evidence that Jesus was a real man. It is quite staggering that our education system is producing so many adults who are so incredibly ill-informed about the basics of Christianity. The fact that the majority of children have had minimal contact with a church is not an excuse. We live in a time when religion is in the news almost every day. It impacts each of us at some level through global tensions and conflicts, as well as through the communities we live in and relationships we hold. The ignorance is only set to increase over the years ahead, and religious illiteracy leads inevitably to misunderstanding, distrust and hostility. Anyone who is familiar with the way Religious Education is taught in schools will know how detached it is from the realities of everyday faith, if not life itself. It is not primarily the fault of the teachers, but more often the gross inadequacies of the syllabus they are required to teach, not to mention its position in the school curriculum. It is mandatory, but sidelined. It is central, but often entrusted to part-time geography teachers or anyone who happen to be Christian/Muslim/vaguely-interested-in-religion. The GCSE exams are woefully inadequate. Investment in the training of qualified teachers has been more than decimated in favour of more ‘rigorous’ subjects. It focuses too much on ritual, stories, festivals and generalised views, leaving students unable to grasp the theological and factual foundations to help them make sense of what they see going on in the world around them. This is not just my opinion. Various academics and educationalists agree this is the case. So, too, does Ofsted, which accused more than half of England’s schools of failing to provide adequate Religious Education in 2013. More than one million children – of all faiths are none – are educated in our church schools, and through RE, collective worship and the Christian ethos of the school they will all hear about Jesus and the significance of his life, death and resurrection and how it can impact them today. We are committed to excellent RE and are producing a new resource to transform the teaching about Christianity, which is currently being piloted in Church schools and community schools as well. Well, that’s potentially good news. That’s a big chunk of our school population who will leave school knowing that Jesus isn’t a mythical being. We’ve just got to persuade the government and advise headteachers and governing bodies to do something about the remaining seven million who aren’t going to be so fortunate.